In my book you can't do much wrong if you got the balls to include a Supertramp song on your album... and Exawatt from Italy has done exactly that with "Breakfast in America". Quite possible a big unknown to most, and me, I can tell you that they began back in 1991. They released their first album "Time Frames" in 2006 and are now ready to unleash their second album upon us. "Among Different Sights" was mastered by Markus Teske (Vanden Plas etc.) at the Bazement Studio in Germany and they have used the same artist for the cover: Portoguese artist Augusto Peixoto. Their take on progressive metal features two vocalists and I think Cecilla Menghi clearly has the upper hand here; she shines on many occasions on this album. Their style has similarities with both the European and American scene and joins the two worlds together very well. But they have some work ahead of them because even though the songs are technically at an acceptable level, they need to step up in the song writing department and the production is at best decent and lacks power. 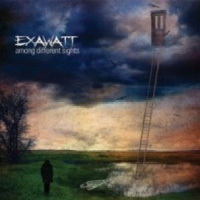 Exawatt is on the right track - do give them a listen... and I suggest you start with these songs: "Exa Watt?! ", "Lucid Dream", "My Friend" and "Stand Before I Crawl".